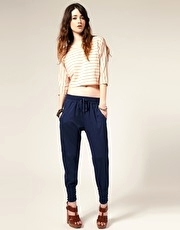 Produktbeskrivning för ASOS Slouch Harem Pant: Slouch harem pants. In cotton jersey with an elasticated waistband, hip pockets to the side, and tapered legs. This garment is also available in our ASOS PETITE collection.